Archer now faces a depleted Toronto lineup that is without the services of Edwin Encarnacion, Adam Lind and Brett Lawrie. The recent loss of Lind is particularly troubling for the Blue Jays as it leaves them without a natural first baseman on their roster. Toronto is batting just .249 with a .318 on base percentage on the road (4.2 runs per game), .232 with a .275 on base percentage over the last ten days (2.4 runs per game) and .205 with a .286 on base percentage in domes (2.7 runs per game). Tampa Bay and Toronto have also been heading in opposite directions since June 11, over which time the Rays boast the record in the American League East, whereas the Blue Jays have gone 9-17. Buehrle’s misleading peripheral statistics are aided by an unsustainable 82% strand rate and a very lucky 6% HR/F rate. The veteran lefty also has to contend with a bad Toronto bullpen that owns a 4.27 ERA and 1.40 WHIP this season, including a 4.47 ERA and 1.35 WHIP on the road, a 4.46 ERA and 1.44 WHIP at night, a 4.19 ERA and 1.51 WHIP versus division opponents and a 7.20 ERA and 2.20 WHIP in domes. In contrast, Tampa Bay’s relief staff owns a decent 3.83 ERA and 1.15 WHIP at home (152/51 K/BB rate; 159.7 IP), a 3.68 ERA and 1.25 WHIP at night and a 3.55 ERA and 1.24 WHIP versus division opponents. From a technical standpoint, Tampa Bay is 27-8 (+14.9 units) in July over the last two seasons. 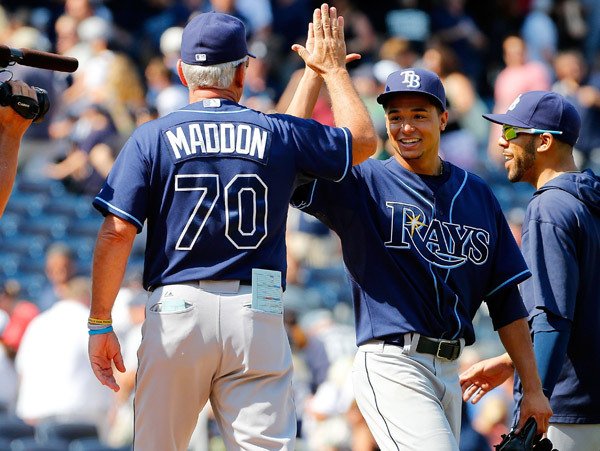 The Rays are also 9-3 in Archer’s last twelve starts as a home favorite, 11-4 in Archer’s last fifteen starts versus A.L. East opponents and 6-2 in Archer’s last eight home starts versus teams with a winning record, whereas the Blue Jays are 1-5 in Buehrle’s last six starts and 0-4 in Buehrle’s last four starts following a loss. I should also note that Toronto is a money-burning 1-8 in its last nine road games, 1-9 in its last ten games as an underdog and 0-5 in its last five games versus right-handed starters. With Tampa Bay standing at 16-7 (+6.0 units) at home in this series over the last three seasons, take the surging Rays and invest with confidence.